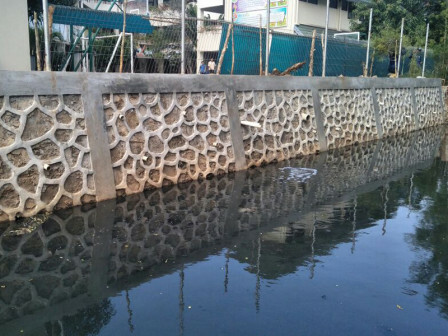 Retaining wall repair towards 10 water channels in Kelapa Gading Sub-district, North Jakarta has started since January and recently its repair reaches 1,760 meters long.
" Those retaining walls are damaged with different conditions"
Kelapa Gading Water Resources (SDA) Unit Head, Rukmana informed, 4 of 10 water channel retaining walls that have been repaired are Gading Kirana PHB channel, Gading Batavia PHB channel, Janur Elok PHB channel, and Kelapa Puan PHB channel. "Those retaining walls are damaged with different conditions, such as collapsed, cracked, degradation, and prone to collapse," he conveyed, Wednesday (7/25). Currently his side repairs PHB channel with 155 meters long on Jl. Flamboyan. While four remaining locations such as Kelapa Cengkir PHB channel, Prihatin PHB channel, and PHB channel on the western side of Kodamar Tengah Reservoir are on survey progress. Repair on those four channels are estimated to reach 500 meters long. "Beyond those locations, we will p rioritize any channels that need immediate repair," he added.